Yesterday I took advantage of my first day of Work Quarantine to go volunteering. But when I took my bike to Saitama Super Arena at about 8:20 as advised, I was greeted by a guy with a sign saying they already had enough volunteers. 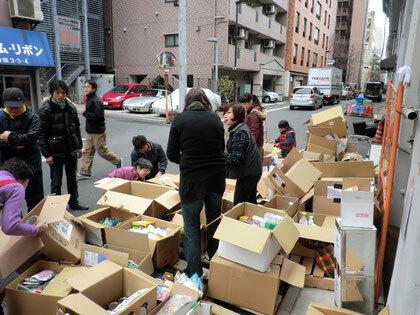 It seems that Japanese people get going early even to help out. Determined to do something useful somewhere, I had three other possible stops on my list, including Tokyo City Hall in Shinjuku, where I’d seen TV reports of a warehouse full of stuff getting ready to go north. But it turned out that my first stop was more than happy to take me in, and I ended up spending the day with Second Harvest in Akihabara. From 10:00 a.m. to 6:00 p.m. we opened, searched, sorted, re-packed and loaded dozens of boxes of face masks, canned goods, adult and children’s diapers, tissues, toothpaste, towels, and the random detritus that people think to donate in a time of crisis. The key points were to keep like items together and to ensure that nothing expired before May, as some boxes may yet end up sitting in a warehouse for a while. 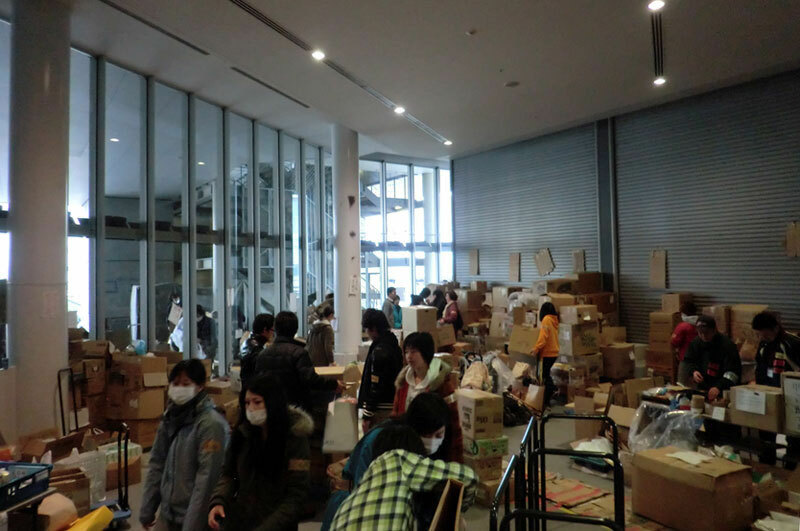 Second Harvest is normally a soup kitchen and food distribution center for poor families in Tokyo, and they have several large distribution trucks that have been commandeered and redirected to the Tohoku area. I mistakenly thought their normal clientele to be the homeless, but the few families who came by in the afternoon just looked like they were down on their luck rather than destitute. My favourite part of the day was dividing delectable-looking fruit and vegetables among several boxes for the local needy, supplemented by mounds of bread and pastries donated by Costco, some of which served as a snack for the volunteers in the mid-afternoon. I had never actually volunteered before. When I was in Boy Scouts, we were supposed to do X number of hours of volunteering in order to get our “Citizenship Badge”, and I never got around to even doing one. Today I made sure I got to Saitama Super Arena at 7:00 a.m., and was happy to find only about ten people in front of me. Volunteers moved in and out around us, setting up tables as evacuees wandered about in the early morning. One of the evacuees stopped to thank us all. It was a good start. It seemed that everyone in line was a first-time volunteer. I spoke to a middle-aged lady who seemed a little befuddled as to why she was there, but she felt she had to do something. The older guy to my left had taken a day off his normal job putting facing on houses, and shrugged as he told me that his university-aged son was at home playing video games. The first arrivals had been a chatty pack of first-year students from a community college studying to become public officers. Around 8:30 they took our names, and at 9:30 we finally got our tasks. Spending the intervening hour huddled in five rows shivering in a cold concrete alcove, duct-tape strips reading “Volunteer” on our arms and public announcements about food distribution and group events playing over the speakers, it felt eerily like we were about to be admitted to a concentration camp. But we’d all fought to get in here. Only the first fifty people had been taken. One announcement outlined a soccer seminar to be run by the Urawa Reds, a J-league soccer team that won the Asia Cup several years ago. At 1:30, they would take the first hundred elementary school students who got in line. 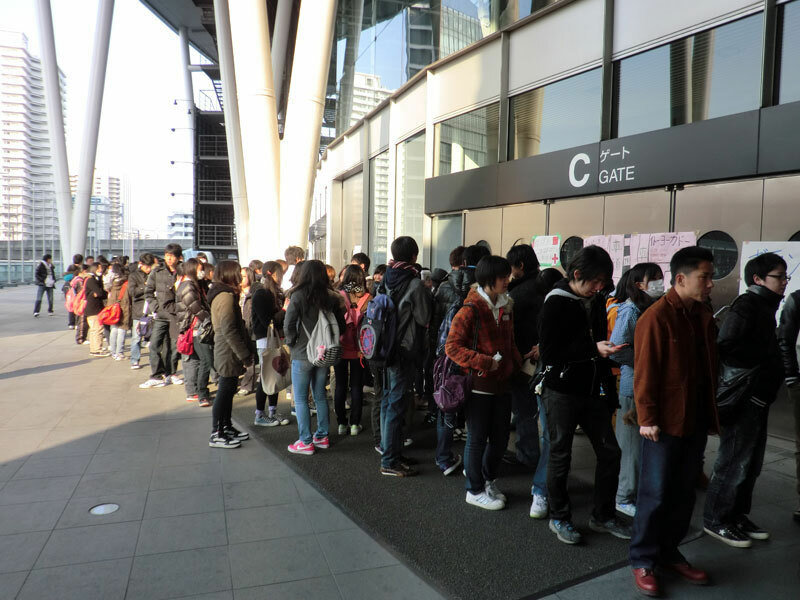 This was how it dawned on me that there were more than a hundred elementary school students living in Saitama Super Arena. We received a remarkably clear set of fundamental principles for our work, with Commandment 1 being to respect the feelings of those who came asking for our help, and rather than demanding that they come to us as suited our needs, we were to bend over backward to meet theirs. These people knew what they were doing. I ended up with the house-facing guy and two community college kids dividing and arranging “random articles” (“zakka”) for the refugees to pick up. We were briefed en masse and set to work with one experienced leader in each group. Some people in the background had circles on the letters of their “Volunteer” badges, which I later learned represented their number of days on-site. I spent the day making sure that a random and ever-changing selection of shoes was arranged for easy distribution, and not one moment felt wasted. The distribution area was just outside the arena, surrounded only by a line of orange ribbon, and people were allowed to enter in small groups to prevent rushing. Beside our collection of blankets, bags and shoes were groups distributing clothing, toys, books, diapers and snacks. Some people came back several times looking for shoes in the right size or of a weight that was light enough for them. Within a few hours I could summarize our varying stock in a heartbeat, and with so many people leaving without finding anything in their size, I bubbled with joy whenever a new box of donations was dropped at my side. My highlight of the day came when a lady spent a minute calmly explaining the Japanese expression for someone with limited motion, and I was ecstatic to have just been given two pairs of easy-entry shoes in exactly the right size. In the afternoon, I took a circuit of the inside of the arena. Reporters and cameras were only allowed up to the entrance, and no photos were to be taken inside. I had been of the impression that people had been living in the arena itself, but this did not seem to be the case—or perhaps I just couldn’t find the entrance. Families were lined up down the hallways of the arena, which must have added up to more than a kilometer in length. On the upper floors, grandparents who should have been at rest in their homes were lying out on ground sheets padded with cardboard and futons, entirely in the open. On the more spacious lower levels, families had made pens and forts out of cardboard, kids inside playing on their DSs and PSPs. Aside from the washrooms, there was no privacy beyond what you made out of paper. There were doctors and nurses walking the halls and consulting with the elderly. There was a free massage center for refugees, and I spotted a physiotherapist walking people through some basic stretches to keep themselves limber. With nothing at all to do, many people were just lying asleep in the middle of the day. There was a big group in front of the disaster loan center, an officious-looking disaster coordination center, and even a temporary town hall. The entire town of Futaba-machi had been plucked up and put down here. Starbucks had even set up a booth with free coffee outside. I’d always felt that just being relocated wasn’t such a big deal compared to having your entire town shattered by a tsunami. Looking at the way these people have to live every day, possibly without ever having hope of return, I don’t think I can any longer consider suffering in relative terms. Until two weeks ago, these people all had lives of their own. Sometime in the afternoon an indie film crew from Germany showed up and asked me a few questions. I had to admit that I had no idea who was in charge or where the donations came from, but I did my best to avoid speculation without seeming cold. 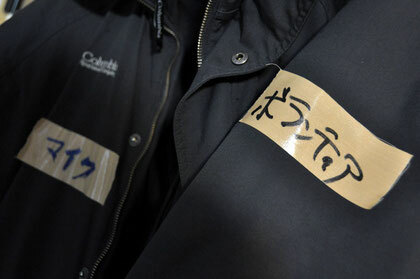 Was I surprised that something like this could happen in Japan? I followed that up with quite a bit more detail than I think the interviewer was ready to receive. Never ask a ten-year Japanophile a simple question about this country. Some recently-graduated elementary school students came by in the middle of the day handing out flyers for a community sports event and open day specifically for the refugees. I challenge you to find better kids anywhere on the planet. Half of our volunteers were high school girls and college kids. The meaning of Commandment 1 (“Thou shalt not think of thine own convenience”) became clear as we packed up at the end of the day: Right after we finished putting away the boxes, we immediately tore them all open again to meet a late request for a pair of shoes. At our final debriefing, one of the college kids was picked out to be the leader for the “life goods” section for tomorrow. Nineteen years old, this guy had been a powerhouse all day, spinning circles to find things for people, then rushing in and out of the arena to hunt things down for people who couldn’t move up and down all the stairs. For some reason, all the college kids seemed really excited to get a chance to work with me, but I was more impressed with their zeal and enthusiasm, and I completely repented my early-morning concern that their geniality might be a sign that they were taking it all too lightly. It was only as we broke for the day that I realized why one of the younger guys had been staring at me since the morning—he was the clerk at my local 7-11. This was why I had wanted to head out to the Arena today. I wanted to see the faces of the people I was trying to help, and I wanted to do it with people from my own community. Second Harvest had been good, but everyone there was Tokyo-based, and I had no connection to them. But when our leader thanked everyone and asked how far we had travelled to help out, I said it had taken about six minutes by bike, and he nearly smacked me and insisted that I come back every day. That’s the kind of place where you’re supposed to be. Sadly, I’m spoken for over the next two days. But I still have my “Volunteer” badge, which is a backstage pass that will let me skip the line when I go back on Monday. The left says "Mike." The right says "Volunteer." I’ve often written that I’m looking for things to make life feel meaningful. Today, all I did was sort shoes. And I do not doubt that, at long last, I did something worthy of myself.